The BeagleBone Blue is the affordable and complete robotics controller built around the popular BeagleBone open hardware computer. Linux-enabled, the Blue is community-supported and fully open-source. High-performance, flexible networking capabilities are coupled with a real-time capable Linux system and a compelling set of peripherals for building mobile robots quickly and affordably. Utilizing the pre-configured Wi-Fi access point, starting your code development is as simple as connecting a battery and opening your web browser. 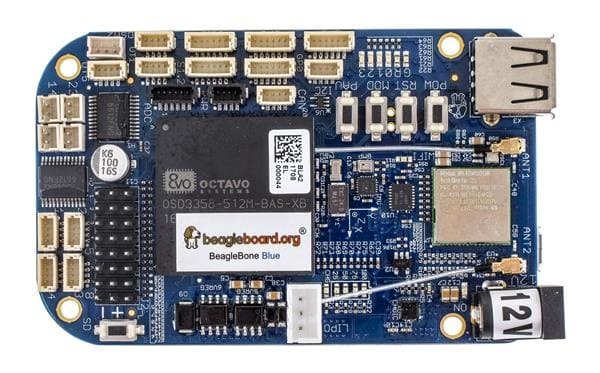 BeagleBone Blue features an Octavo Systems OSD3358 System-in-Package microprocessor together with WiFi/Bluetooth, IMU/Barometer, power regulation, and state-of-charge LEDs for a 2-cell LiPo, H-Bridges, and discrete connectors for 4 DC motors+encoders, 8 servos, and all of the commonly-needed buses for additional peripherals in embedded applications.